NASA has selected a mission that will perform the first reconnaissance of the Trojans, a population of primitive asteroids orbiting in tandem with Jupiter. The Lucy mission will launch in 2021 to study six of these exciting worlds. The Lucy spacecraft and a remote-sensing instrument suite will study the geology, surface composition, and bulk physical properties of these bodies at close range. The payload includes three complementary imaging and mapping instruments, including a color imaging and infrared mapping spectrometer from NASA’s Goddard Space Flight Center in Greenbelt, Maryland, a high-resolution visible imager from the Johns Hopkins University Applied Physics Laboratory, Laurel, Maryland, and a thermal infrared spectrometer from Arizona State University, Tempe. In addition, Lucy will perform radio science investigations using its telecommunications system to determine the masses and densities of the Trojan targets. “Understanding the causes of the differences between the Trojans will provide unique and critical knowledge of planetary origins, the source of volatiles and organics on the terrestrial planets, and the evolution of the planetary system as a whole,” said Dr. Catherine Olkin, the mission’s deputy principal investigator from SwRI. “The Lucy mission is one of those rare moments where a single mission can have a major impact on our understanding of such fundamental questions,” added Dr. Keith Noll, Lucy project scientist from Goddard. The mission will launch in October 2021 and fly by its targets between 2025 and 2033. 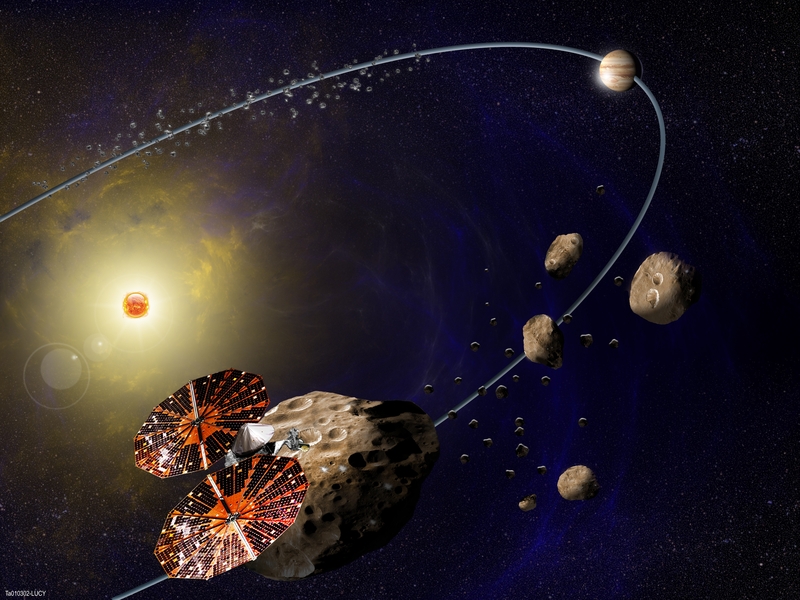 In all, Lucy will study six Trojans and one main belt asteroid. Southwest Research Institute (SwRI) in Boulder, Colorado is the principal investigator institution and will lead the science investigation. NASA’s Goddard Space Flight Center, Greenbelt, Maryland will provide overall mission management, systems engineering, and safety and mission assurance. Lockheed Martin Space Systems in Denver, Colorado will build the spacecraft. Discovery Program class missions like these are relatively low-cost, their development capped at about $450 million. They are managed for NASA’s Planetary Science Division by the Planetary Missions Program Office at Marshall Space Flight Center in Huntsville, Alabama. The missions are designed and led by a principal investigator, who assembles a team of scientists and engineers, to address key science questions about the solar system. This article was originally published by NASA.